DVD-R or Digital Versatile Disc Recordable is one of the recordable formats available on the DVD market created by Pioneer in 1997. DVD-R is a write-once format where the initial record is burned permanently into the disc and cannot be erased. A DVD-R’s approximate lifespan is 100 years. Its primary competition in the format war for dominance and support in the industry exists with the DVD+R format. The difference between them rests on the disc’s individual tracking systems and speed control (ADIP for DVD+R and LPP for DVD-R). It’s up for debate which format is better, but technology has been created to be dually compatible to accept both, such as hybrid drives. The DVD-R format is supported by but not limited to: Pioneer, Fuji, Sony, Toshiba, Apple, Hitachi Samsung, and TDK. A DVD-R is engineered from two bonded 0.6mm polycarbonate discs, which together add up to the 1.2mm thickness of a compact disc. A dye layer is used for recorded data. The first of the two polycarbonate discs carries the dye layer that is topped by an alloyed silver or gold reflective layer. 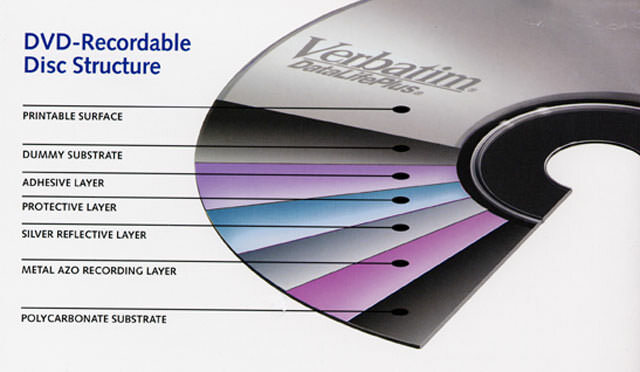 The other layer, also polycarbonate, is purposed as a “dummy disc” to maintain the mechanical strength and durability of the DVD-R as a whole. The dummy disc also serves to protect the data layers from scratches and other damage. The sandwiched polycarbonate layers also allow the driver’s laser to reach the recording layer in nearly half the laser wavelength of a CD, which therefore allows the beam to write data with more accuracy than some optical media predecessors. The pre-grooves of the DVD-R have a wobble frequency instead of perfectly spiraled pre-grooves. This indicates that the groove wanders at a specific modulated frequency to guarantee precise tracking and timing at a high pit density. There are both professional and consumer DVD-R’s in existence. A DVD-R for authoring is for commercial content generation which needs slightly shorter laser wavelengths for precise recording and compatibility with disc authoring devices. A DVD-R for general media is aimed at everyday consumer and home use. These two types of media are in place because authoring grade discs are not meant for the everyday consumer. General media is created due to the content protection needs of CSS-encrypted entertainment titles. It is very important for proper function that both types are recorded in their respective proper drives. However, both grades can be played on CD-ROM drives or DVD players that support playback of the DVD-R format. DVD-Rs are backwards compatible in that they function in a vast majority of existing DVD players and DVD-ROM drives, which facilitate easier archiving and at-home consumer purposes.